Aspen Systems Inc. continues to meet requirements, set by the “ISO:9001 2015” International Standard as confirmed by an independent evaluation of Aspen’s Quality Management System, by Intertek, an internationally recognized Certification Body. Marlborough, MA – Aspen Systems, Inc., a Massachusetts-based manufacturer of miniaturized refrigeration systems is proud to post its recent ISO 9001:2015 certification. ISO 9001 registration confirms that organizations can demonstrate continued conformance to the requirements of the standard. Aspen have been registered to the ISO 9001:2008 version, since 2013 and have recently upgraded their management system to align with new ISO 9001:2015 revision. Aspen was within the deadline of September, 2018 to show that the necessary revisions, had been incorporated into their operations. The structure and requirements of the standard have not significantly changed, however there are certain new elements of the standard that need to be addressed such as the requirement to adopt ‘risk-based thinking’ in the implementation and operation of the management system. The revised ISO 9001:2015 standard suggests the adoption of a ‘High Level Structure’, similar to other standards and continues to encourage the use of the Plan, Do, Check, Act (PDCA) cycle to identify and drive systematic improvements to an organization’s processes and outcomes. 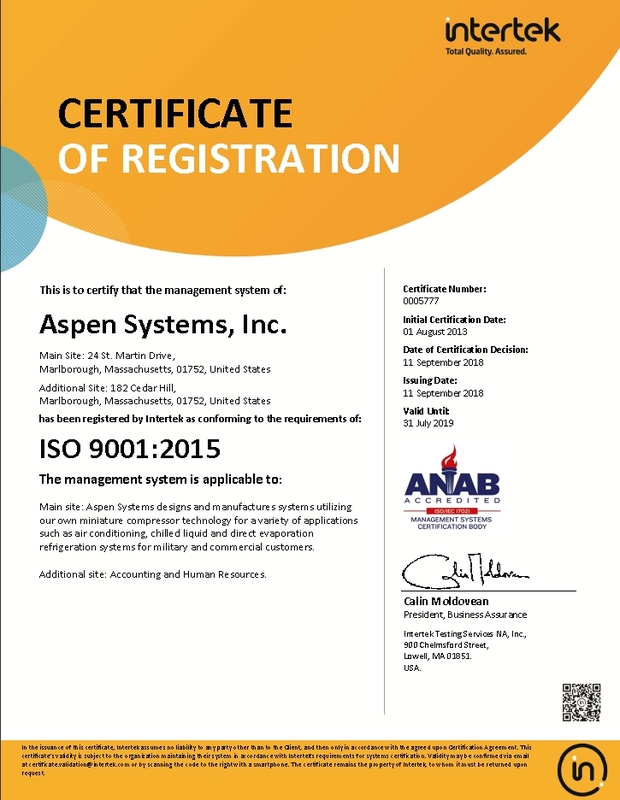 Aspen is proud to maintain their registration to the new ISO 9001:2015 standard. Incorporating risk-based thinking is not new to most companies and it should be used routinely when trying to meet expectations and needs of all ‘interested parties’ or stakeholders involved with the management system. “As any company that has been through the process knows, achieving ISO 9001:2015 certification is demanding,” said Kang Lee, Chairman and President of Aspen Systems Inc. “Each individual and organization must be dedicated to the pursuit of quality and continuous improvement; now more than ever”. Since its origin in 1984, Aspen has been recognized as a pioneer in the development of miniature refrigeration thermal management systems technology. As a result, Aspen has continuously provided advanced technology products and has become an industry leader for miniature refrigeration systems. “ISO 9001:2015 certification supplements our technology leadership position,” said Glenn Deming Vice President of Aspen Systems. “While continually improving our existing products and finding new applications for miniature refrigeration technology, we also want to ensure that every product meets or exceeds our customers’ expectations”. 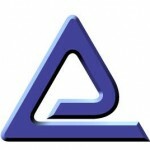 Aspen Systems, Inc., founded in 1984, has been developing innovative and advanced technologies in diverse areas and selling related products around the world through spinoffs, subsidiaries and business units. Compact, lightweight thermal management systems for a broad range of applications are made possible by using the world’s smallest refrigeration compressors developed by Aspen. Our compact refrigeration systems provide high efficiency cooling with low power consumption to meet the challenges of our customer’s demanding needs. Learn more at http://www.aspensystems.com. ISO (International Organization for Standardization) an independent, non-governmental international organization with a membership of 162 national standards bodies. ISO International Standards ensure that products and services are safe, reliable and of good quality. For business, they are strategic tools that reduce costs by minimizing waste and errors and increasing productivity. They help companies to access new markets, level the playing field for developing countries and facilitate free and fair global trade. Learn more about ISO at www.iso.org. Copyright © 2018 Aspen Systems Inc. All rights reserved.